As we leave the town of Natchez, Mississippi – after attending the joint Louisiana B&B Association and Mississippi B & B Association conference, we are excited by all of the new information, and the new friends we made while we were here. Lisa, Mark, and I (Willie) – arrived late on Sunday to our rooms at the Monmouth Plantation – a spectacular antebellum mansion near Historic Downtown Natchez. In the morning, we were treated to a magnificent breakfast, including the best omelet I have ever eaten, in the inn’s spacious dining room. 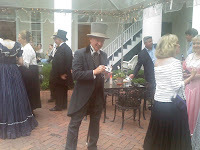 We were invited to the conference by the President of the Mississippi Association, Peter Sharp of the Fairview Inn, having recently launched a new Web site for his property. We then traveled to the location of the conference, the Natchez Conference Center in the heart of the historic downtown district, blocks away from the scenic overlook of the river. While setting up our display – we had the pleasure of meeting Jim Bob Allgood, famous as a member of the Redneck Adventures television show. As the conference began, we had a chance to talk to many of the innkeepers during the wine and cheese reception on Monday afternoon. However, business was mostly postponed for the following day, as the majority of the innkeepers had a full day touring the inns of Natchez. 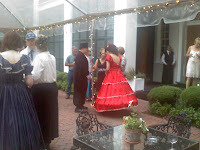 After the reception – we returned to Monmouth Plantation for a costume dinner, which was attended many innkeepers in period dress. The conference began in full swing on Tuesday, with a presentation on industry trends provided by Jay Karen of PAII. Later in the day, Lisa had a double presentation on Web site trends, SEO optimization, and Google gadgets. Although she only had two hours of presentation time, she did have a chance to give a thorough review of this information. Additionally – she allowed all attendees to sign up for post conference Webinars to provide further detail on many of the features covered during the presentation.